Good character centric dialogue which could have been in the show. Walsh's art is simplistic but works well and he captures the likenesses of characters well. Those expecting a continuation of the mythology straight off will be disappointed. Dana Scully and Fox Mulder are now living under different names, and have their quiet suburban lives interrupted by the re-appearance of an old friend with news that has major implications for the pair. It’s several years since the last X-Files film and over a decade since the series finished, but such an iconic show doesn’t lose its fans. This new series from IDW and X-Files creator Chris Carter has the potential to be what any fan could want – with the limitless scope of comics anything is possible. Whilst the X-Files may be rather infamous for it’s convoluted mythology, that alien colonisation story was building up throughout the series. However Carter and Joe Harris (both responsible for the story with Harris doing the actual writing) wisely haven’t jumped into the mythology with the first issue. This initial outing is setting up a story much in line with the ‘monster of the week’ style and this is no bad thing, after all some of the most memorable things from the series were these stories. Who can forget Flukeman or Eugene Victor Tooms? How this will work in this new medium though remains to be seen. 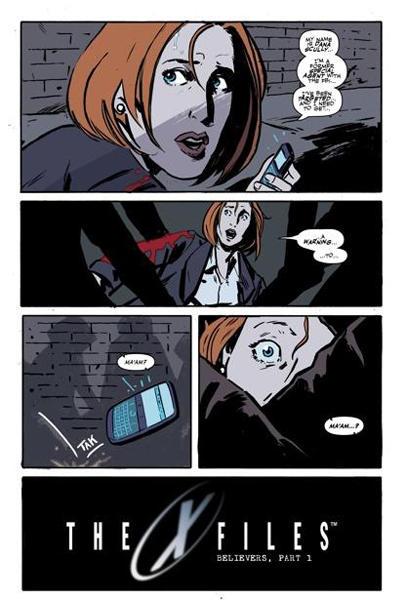 Scully finds herself in a bad place alone. A key thing with any licensed property is getting the the feel of the characters right, and Harris manages to pull this off rather well. Mulder’s deadpan sarcasm is dead on and could be from an episode of the show, whereas Scully, now a doctor serving the local community, is more rational when it comes to hearing the news from their old friend. There’s a nice in-joke after Mulder encounters some kids in the street and impresses them with some sleight of hand whilst pointing out that playing baseball in the street is not the best of ideas. There are hints at a bigger story going on in the background, but it’s the creepy and mysterious goings on involving a little girl that Scully has been treating (amongst others) that make up the main story here. Thankfully it doesn’t stretch believability to breaking point despite the avenues available in this new medium, and it packs plenty of atmosphere and that feeling of intrigue that The X-Files is fuelled on. Mulder makes some friends in the neighbourhood. Another wise move is to not bog down readers in backstory exposition establishing the relationship between Mulder and Scully. Harris and IDW are taking it as a given that you know who these characters are and their history and it’s all the better for it. 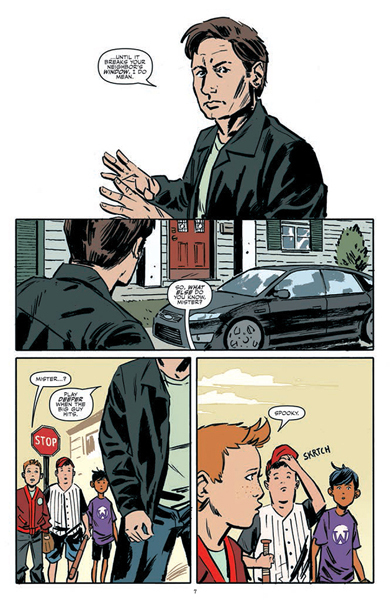 Michael Walsh‘s art has a minimalistic approach which doesn’t feature much in the way of detail but it works, and works especially well in panels where characters are talking – the lack of background noise lets the writing stand on it’s own. Walsh also has a good grasp on the character likenesses which is a key aspect for any title based on a licensed property, if the characters look nothing like their real life counterparts than it all breaks down.